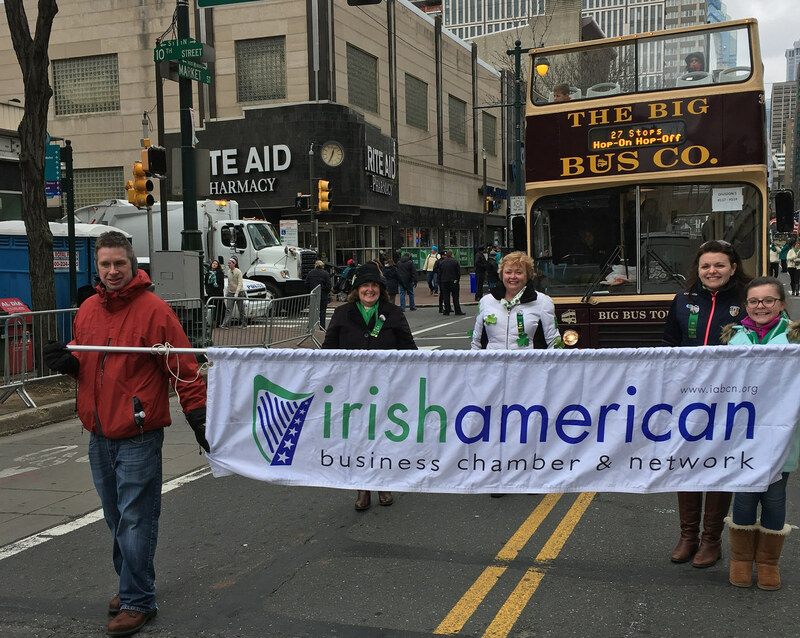 Parade Day with the Irish Chamber! 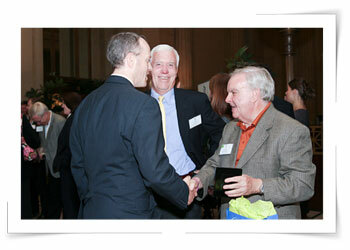 We are looking forward to a wonderful day for the 250th Annual St. Patrick’s Day Parade. You can walk along side our double-decker bus, or hop on for a rest. Fox 29 TV will be airing the parade live, 12.00 to 3:00 PM on Sunday, March 10th and will rebroadcast parade coverage on Sunday, March 17th, from 12.00 to 3:00 PM. This year, the Irish Chamber will be in Division 4, we will line up on the SOUTH side of JFK Blvd, between 17th & 18th Streets. This is the third year for a new parade route. To view the map, please click HERE. To see the complete parade route, please click HERE. This year, a portion of ticket sales will be donated to the Liam Hegarty Memorial Liberty Bell Tournament Fund, happening this April. Tickets for Irish Chamber members will be discounted to $20/adults, no charge for children (the Chamber will subsidize the cost of tickets for our members and children of members, the total cost of the ticket is $50+). Tickets include Irish buffet, beer, wine and music. Click HERE to register to march with our group in the parade. Children must be registered as well as adults. For parking locations near Old Pine Community Center, please click HERE. 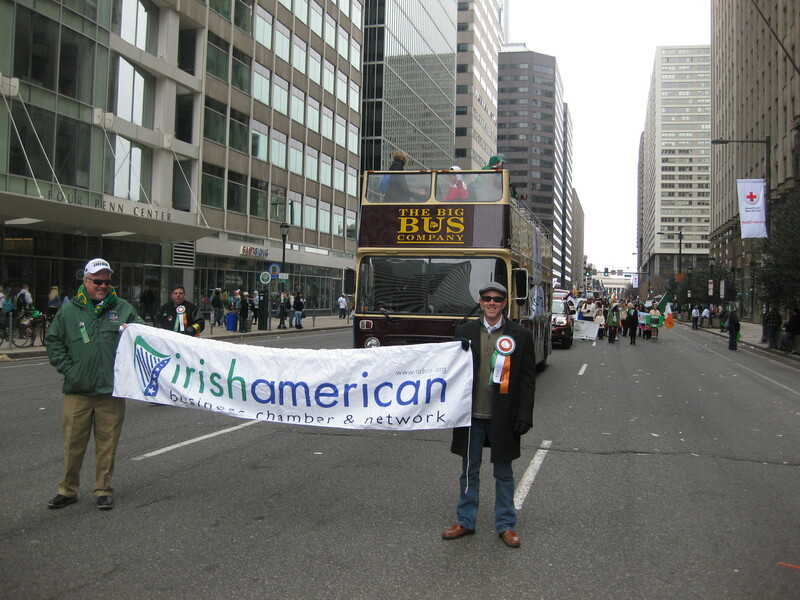 11.30 am – 12.00 pm: Meet IABCN double-decker bus on JFK Blvd (SOUTH side of JFK Blvd, between 17th & 18th Streets). The first divisions of the parade are scheduled to kick off promptly at 11.00 am. 3.00 – 3.30 pm: Parade ends performing area, 5th & Market Streets in Old City. Look for our double-decker bus on the parade route. 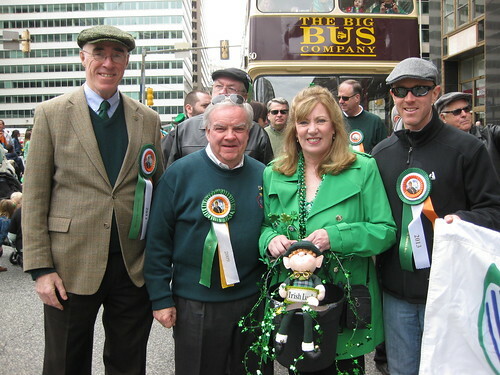 Pictured here in the 2013 St. Patrick’s Day parade with (L-R) Bill McLaughlin, Christine Hartmann and Kevin Kent.